Alderney’s landscape is rugged and beautiful. 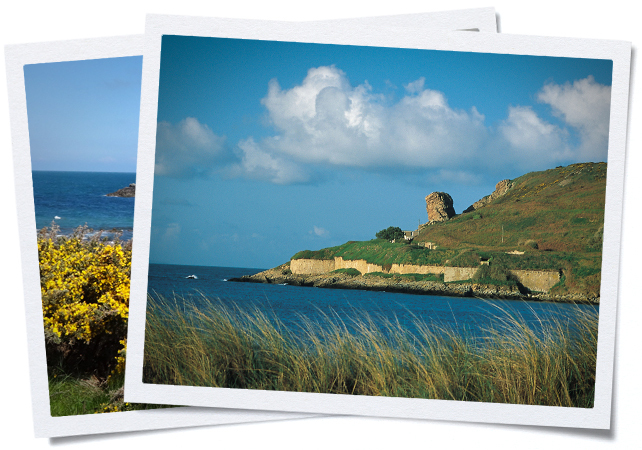 There are large areas of green common land, long sandy beaches and craggy cliffs with views out towards France and the other Channel Islands. The island is dotted with fortifications with structures ranging from the Nunnery, believed to be one of the best preserved small Roman forts in Britain, to the thirteen Victorian forts built to protect the harbour, and the many bunkers erected by the occupying Germans in the Second World War. The island is just 3.5 miles long and 1.5 miles at its widest point. Although Alderney is small there are over 50 miles of lanes and country paths which make it an ideal place for walking. Outside town there is little traffic and the speed limit is just 35 mph, making it a very safe and pollution free environment. The wide expanses of common land are largely left in their natural untamed state and give the island a wild and unspoilt feel. Walking and cycling are the best ways to see the island, particularly as some of the tracks are a little rough and therefore discourage cars. The tides around Alderney are powerful and even in calm seas white horses can be seen off the coast. The Swinge, a tidal stream out to sea between Alderney and Burhou, is particularly treacherous. The Braye Harbour breakwater protects the island from the Swinge and means that the water (other than at Platte Saline) is calm and safe for swimming. A mile or so out to sea, the Swinge is at its fiercest, and in rough weather has been the cause of several wrecks. One boat that suffered long ago in Alderney’s waters was an English warship from the Elizabethan age, discovered in 1977 and of great interest to historians as the only known wreck of its kind in the world. Artefacts from the wreck are on display at the Alderney Society Museum.